This table is so regal and gorgeous. This customer was local, so she dropped off her grandmothers antique table, and asked me to design and hand paint the piece, to match her new family room decor. You can see from the pictures that I selected patterns and colors that coordinated with the accent pillow in the room. 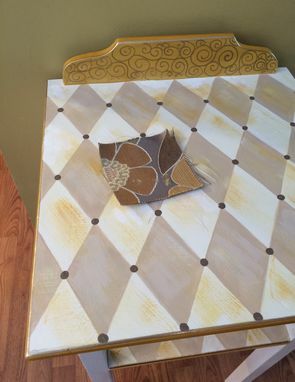 The rest of the furniture was basically solid, so the addition of the creamy tones and ocre and gold accents, were the perfect addition. And as if it wasn't beautiful enough, the addition of a fancy beaded tassel trim, just took it to another level. While this table was the customer's own, this pattern would look perfect, recreated on one of my 12x12x28, or 14x14x14 accent tables. They're the very same shape and would be the perfect addition of whimsey and sophistication that we all love so much! 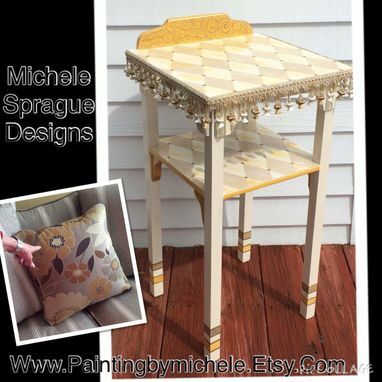 While this listing is to recreate this design on the tables I've suggested, I specialize in custom work. So if you love this pattern but want it on an entirely different sized table, a chair, a lazy susan, a candlestick - whatever - just contact me. We will work out the details together.